The Royal Fitness Equipment series features an elegant colour scheme and premium instructional signage to help stand out from the crowd. Smooth rounded support poles provides a premium finish and reduces injury. All plastics are UV stabilized and heavy duty suited for all locations. Stainless steel security fixings protected by anti-vandal caps with weather resistant aluminum instruction signage with 3M anti-graffiti vandal film protection. 125mm steel or aluminium round powder coated posts with alloy caps. Optional slab mount feet. Don’t forget to check out our Hybrid series below to mix and match different fitness equipment apparatuses on each station. 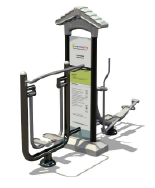 The standard fitness equipment series are a simple, robust system yet affordable way of supplying outdoor gym equipment in your communities. Various range of colour choices and easy to use installation manuals are available upon request. For large projects needing bulk equipment on a tight budget the Standard fitness series is an ideal choice for your community. Don’t forget to ask us about under surfacing. 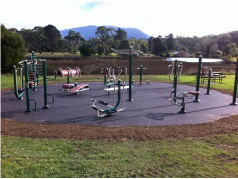 Outdoor Fitness Australia can also supply and install various surfacing from mulch to rubber soft fall tiles and rubber wet pour at a competitive rate! Hybrid fitness equipment series offer value for money by fusing two types of exercises into one machine. This means you get double the Fitness activity in half the space! Similar to our Royal Fitness series with the ability to mix and match different machines onto the one station using space and saving money for those projects on a tight budget but wanting more of a premium range. Don’t forget, both the Royal Fitness series and Hybrid series have the optional plastic moulded roof and both series come with aluminum instructional signage with 3M anti-graffti film coating to avoid vandalism. 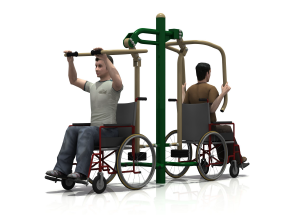 Our Universal fitness equipment is an inclusive series comprising of features for all abilities. Robust and stylish designs engineered to suit all users. 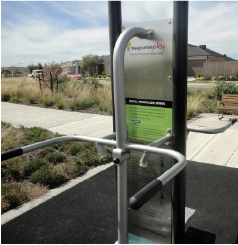 A perfect addition to your fitness area accommodating everyone!